On April 22 1884 a young reporter from England named Thomas Stevens left San Francisco and headed east on a Pope “Columbia” ordinary bicycle. 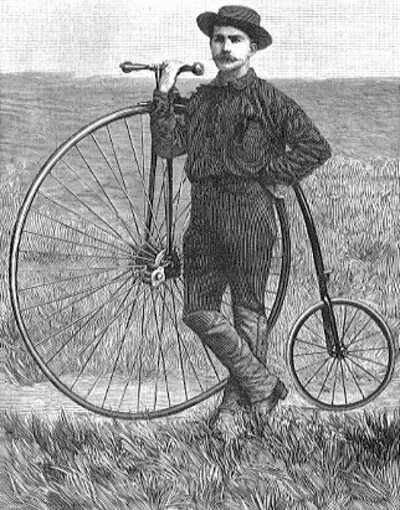 This was a high wheel type bike, and had a 50 inch front wheel. A few weeks into his trip he shot a moutain lion, and 103 days and 3700 miles of wagon roads after starting, he was in Boston. After wintering in New York, he took a steam ship to Liverpool, and rode through England. He took a ferry to Paris, and rode through Germany, Austria, Hungary and was in Bulgaria by June 24 1885. A month later he was in Istanbul, and spent 6 months in Persia. He was arrested in Afganistan and returned to Persia. By August 1886 he was in India, and two months later he was in Canton China. He cycled in Japan and headed for San Francisco by steamer and arrived December 24, 1886. Steven’s wrote a series of letters during his journey which were published in Harper’s magazine. The letters were collected into a book, Around the World on a Bicycle and is available in reprint and in digital form in the Gutenburg Project.